The Olight Warrior X has a metal housing that weighs 218 grams and is 142 mm long with a diameter of 25.4 mm (head unit is 41 mm). With the assistance of liberally placed o-rings, the housing is waterproof rated to IPX8 and is dust proof, shatter proof and shock proof. The flashlight uses a tail switch for operation and uses a CREE XHP35 NW bulb which casts natural white light. This is supported by a smooth reflector which creates a concentrated beam projection followed by a softer flood area around that beam. 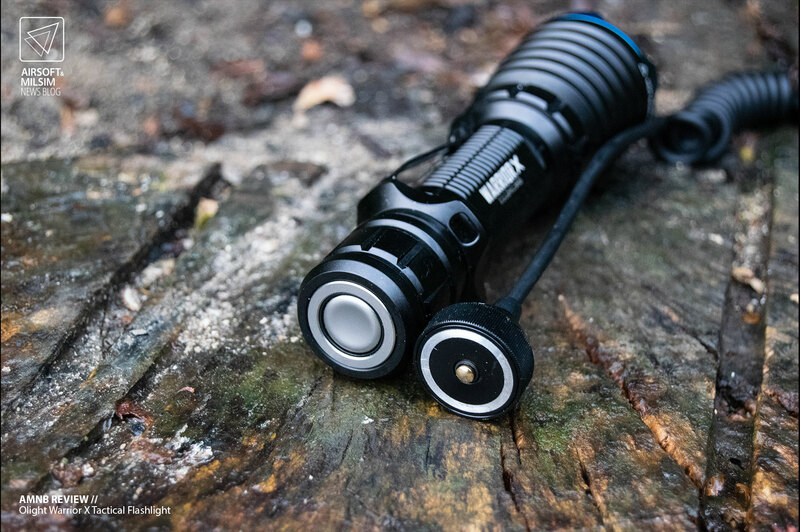 With a maximum output of 2000 lumens (circa 600~ lumens when battery is low), the Warrior X is said to be able to project a beam distance of 560 meters. The output is sustainable for up to 1 hour and 20 minutes (full output is only sustained for 10% of the full potential run time). The flashlight can use an economic output of 300 lumens which is activated with a softer press of the tail switch (two stage switch). With the more economical output, the flashlight can sustain that output for as long as 4 hours and 40 minutes on one single charge. The output of the bulb is powered by a single rechargeable 3000 mah 18650 lithium battery which is charged through the housing using the MCC1A magnetic charging cable that attaches to the tail switch. The same magnetic function is available with the optional pressure switch which only activates the full press of the tail switch. The flashlight’s normal mode setting allows for many functions with one switch. A quick press of the first stage of the switch activates the 300 lumen mode until pressed again. A quick press of the second stage of the switch activates the full output until pressed again. Holding either stage of the tail switch for longer than 1 second keeps the light activated until the switch is released. A “tactical” strobe mode is available by simply untwisting the battery cap, holding the tail switch and re screwing the end cap to switch modes. In the strobe mode, the tail switch’s first stage keeps the full beam on until the switch is released whilst the second stage does the same however with a strobe effect. In addition to the strobe mode. the flashlight has a vibration feature which alerts the user of a low battery through tactile vibrations which are felt on the unit. The front of the bulb housing has serrated edges which are coated in a light blue detailing to protect the lens and could be used to break glass in emergency situations. The grip ring is also interchangeable between a belt clip and a rubber grip depending on the user’s preference. The centre of the housing has grooves which assist in the mounting to other items via the correct accessory. The Warrior X’s aluminium aloy chassis is a mix of slender and ridged cuts which allow for it to not only dissipate heat but also allow a more secure grip with both non gloved and gloved hands. 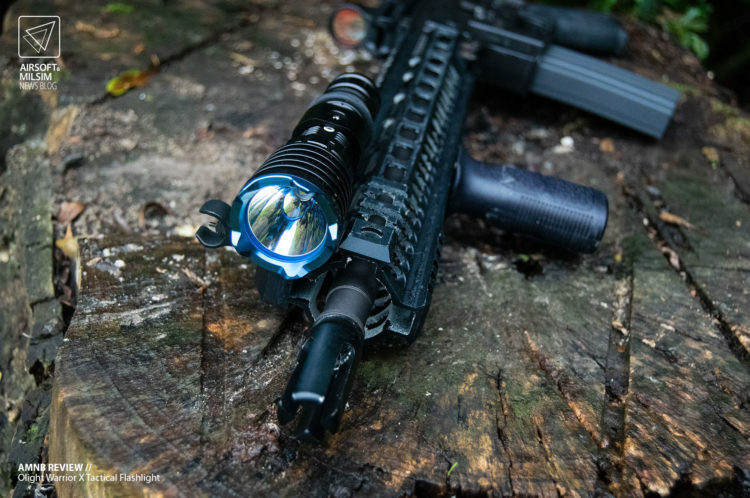 Although mostly coated in a thin, smooth black paint that does not easily scratch, the blue detailing at the crown of the bulb head and the chrome tail switch give this tactical flashlight a little lair and personality. This flashlight is not considered to be a mid-sized unit which is most suitable for hands of many sizes as it is not too wide or thin when held in the hand. 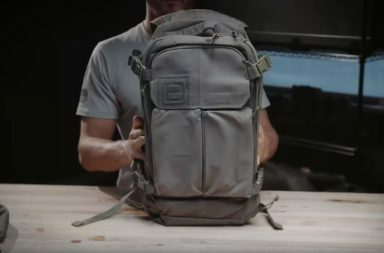 It is however not something you can easily pocket in a small trouser pocket without it bulking out or causing light discomfort when jogging or partaking in a fairly physical activity (climbing, cycling, sports). With the optional rail attachment, the Warrior X is quite sleek and does not protrude too far from the point of attachment. This is of course a factor of the attachment being used and placement by the user. The use of the pressure switch with the Warrior X, covers the chrome tail switch and gives the unit a mostly dark silhouette with a snaking line that coils in the middle before ending at the pressure switch itself. The Olight Warrior X is designed to be used for long distance detection and illumination with a proposed sighting distance of over 500 metres. It is worth noting that this would vary in different conditions and environmental scenarios. The main factor which allows for this statement to be true is for the full 2000 lumens of output to be projected effectively as a beam across the given distance. There are a few issues with obtaining the distance and in the end, is fairly irrelevant to try and match as it is not a realistic distance to expect from a handheld flashlight (although this does not mean that it cannot project to that distance). 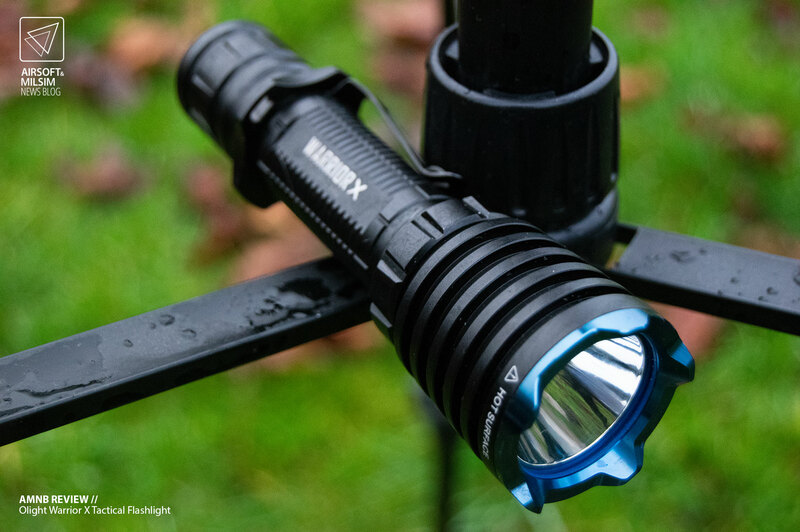 With a full charge and on a cold start, the Warrior X is capable of projecting 2000 lumens and hence reach a considerable distance of 500 metres on a clear night, however this is the maximum output possible for the bulb unit and not the average by far. After a few minutes of usage, the bulb unit heats up (which is quite hot to the touch after a few minutes) and throttles its output down to between 1600 and 1000 lumens based on temperature throttling and the capacity of the lithium battery. This means that prolonged use of the higher setting will lead to a progressively more economical output close to but not similar to the lower output setting of 300 lumens. 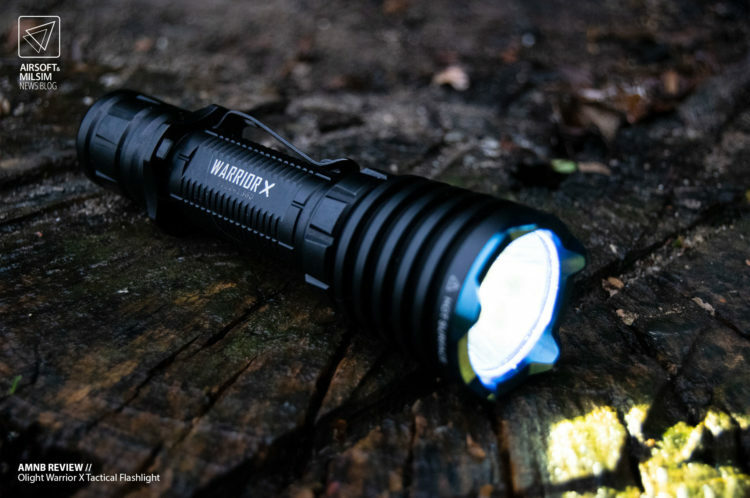 This is more a limitation of the technology available and not a misleading sale of technical specifications as the Warrior X can output up to 2000 lumens in short bursts until the battery runs out. Heat WarningThe high output of the Olight Warrior X will lead to heat dispersion across the unit which can cause skin irritation if left on for too long a period. The same can be said for anything within millimetres of the bulb’s beam and attached to the front of the head unit as it is possible to melt certain plastics and combust flammable materials. 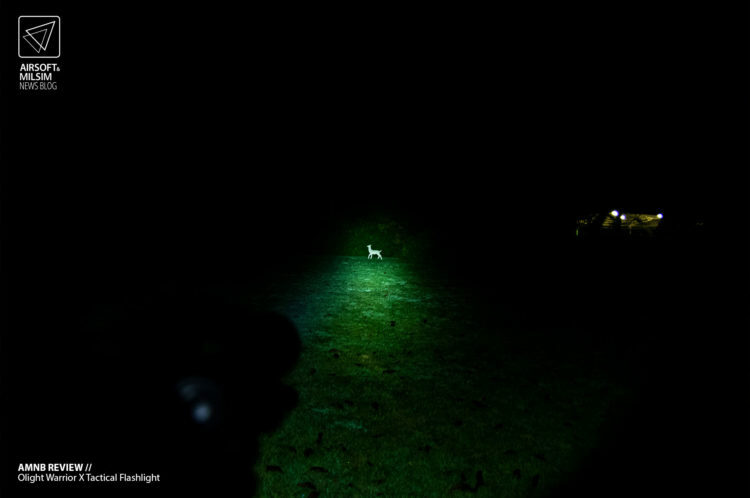 With the lower economical setting on the Warrior X, the 300 lumen output setting is more than adequate for general use for night time pursuits and is capable of reaching at least 200 metres worth of darkness in ideal conditions. Unlike the higher output setting, the 600 lumens are consistently projected throughout the lifespan of a single charge which is very reliable due to the unit not heating up excessively enough to be noticed when handheld. 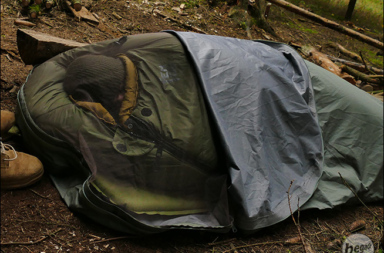 The strobe feature of the Warrior X is fairly simple as it gives the Warrior X more of a disruptive performance for a mixture of scenarios such as self-defence however it cannot be easily switched back and forth. It is also worth mentioning that the strobe will output at up to 2000 lumens for slightly longer due to the intermittent use of the bulb. This feature does not stay on after a press of the tail switch and will turn off the moment the tail switch is not depressed (Same functionality is transferred to the pressure switch when attached). It is nice to see that a flashlight that could see a lot of use is rechargeable as it’s a feature that’s neglected by many electronics brands to this day. It is especially so where the product itself can be charged without any disassembly or need to plug in a cable into a port. The Warrior X is rechargeable via a magnetically docked charging cable which fits against the tail switch and only takes an hour or two to fully charge from near flat. Although it’s not a feature, even though the tail switch is covered, the flashlight is capable of being powered through this cable whilst outputting light (not recommended as control of the tail switch requires disconnecting and could potentially damage the bulb unit and full output). The lithium battery that is used is proprietary to the unit and it is not recommended to use an off brand alternative as that would effect the performance of the flashlight itself. 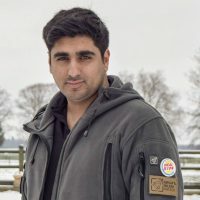 It would not be understandable as to why a different battery would be used considering the entire unit could be recharged without having to remove the battery in the first place. One issue that did arise from repeated removal of the end cap was that there are two o rings which secure the onto the threads of the cap which can easily be lost during removal and could compromise the water resistance in that area. The end cap of the tail switch is the only way of cutting off the function of the Warrior X as there is no mechanical shut off for transportation and preventing accidental activation during transit as a short loosening of the cap will disconnect the battery from the unit. This is also how the strobe feature is toggled and has shown to be a very effective way of adding functional features without adding buttons and complicating the unit overall. We do recommend looking after the o rings in the rear of the unit as this can potentially be the first point where maintenance is required. As mentioned previously, the black coating on the main chassis of the Warrior X is thin but quite robust against small scratches and drops. It is notable that this unit has been designed to withstand normal day to day use and the clumsiness that may come with the lifestyle of outdoor use. The 3mm tempered glass lens of the bulb is very clear and quite thick compared to standard bulbs found in much cheaper flashlights which helps against impacts directly on the glass and allows for the full opacity of light to pass through. The tail switch is recessed within the end cap and has not changed in texture or tactile clicks over the testing period of three months of use. The switch itself is a two stage activation switch which has a non rust finish and designed to outlast the bulb unit before malfunction. Because the tail switch is also a conduit for the magnetic charging cable, there is a small charge of energy that lingers on the surface which also acts as a magnetically sensitive surface to attach to. This is intended for the magnetic charging cable and the magnetic pressure switch. 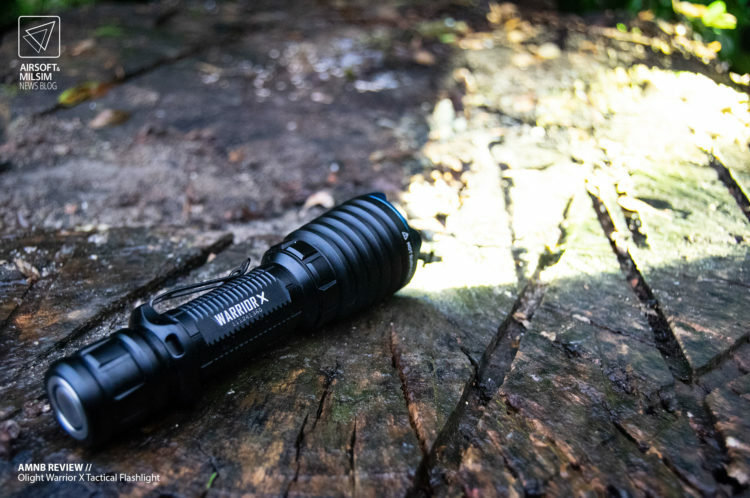 The Olight Warrior X is not a cheap flashlight and is by far not built like many of its cheap alternatives considering the technical specifications and features it presents itself with. This tactical flashlight is a mid-range product priced at just over £110~ which is reasonably priced for a rechargeable high output unit which is handheld and ergonomically pleasing. Other alternatives such as Fenix E35UE at £60~ are much cheaper and simpler flashlights with less features and a lower technical specification. On the other end of the price range, there is the Surefire EDCL2-T which is priced at £170~ but has a lower technical specification and does not include recharge capabilities without opening the unit. 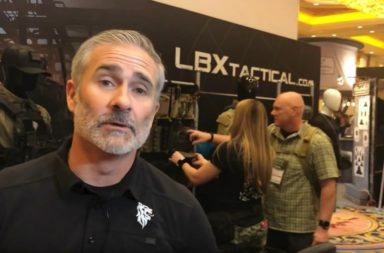 The Olight Warrior X is fairly priced against the competition and could be a flagship leader in affordable tactical flashlights. The Olight Warrior X is packed with a technical specification that far surpasses many of it’s competition and is able to meet most of those specifications in function and durability which is an added bonus for its life span for the user. 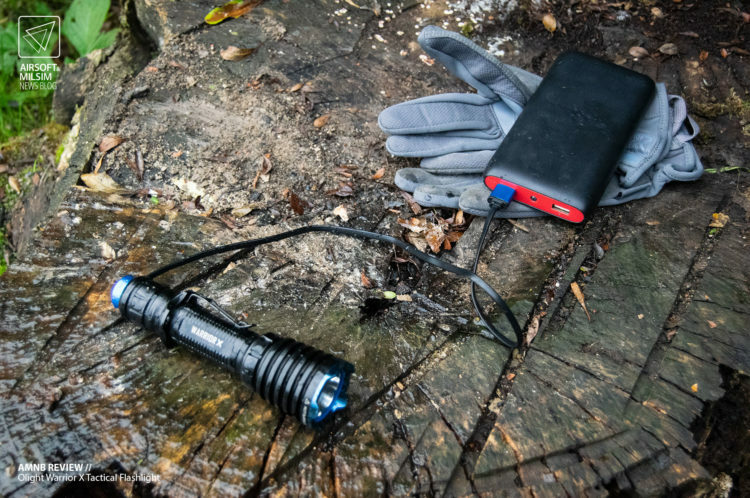 A formidable flashlight that has multiple uses from emergency services to hiking in the countryside. Although there are some issues such as heat throttling during high output usage and the inability to charge the unit without losing the functional use of the tail switch; these issues are fairly minor and do not effect the main use of this flashlight to illuminate the dark and allow the user to see long distances over a long period of time. 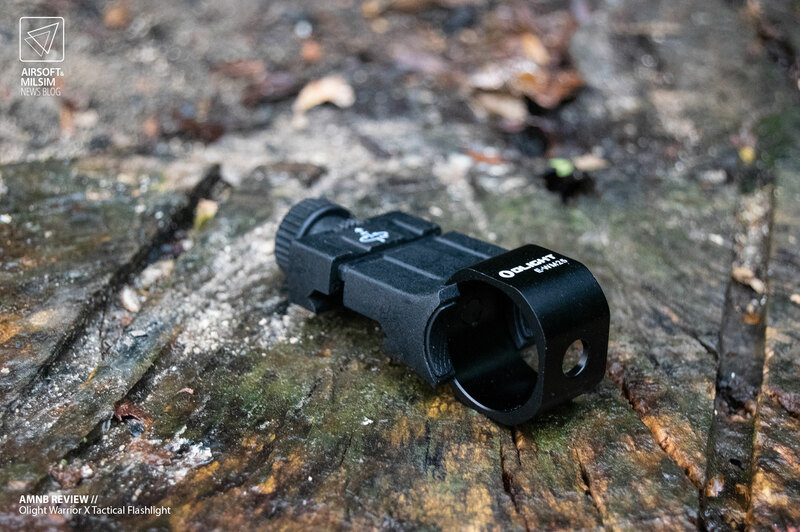 With a competitive pricing and expansive range of features, there is little criticism that can be given to the Olight Warrior X. 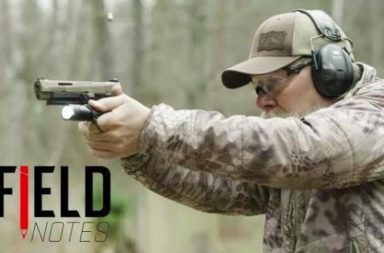 Only time will tell when the Warrior X will be over run by newer models with newer technologies and cheaper price ranges to compete with what is considered to be an affordable powerhouse in handheld form.